Thermodynamic state, path, process and cycles and also "Pure substance in thermodynamics". Today we will see here very important topic i.e. Mass balance and energy balance for a steady flow process with the help of this post. We will use few important terms such as control volume and also steady flow device in this post, hence let us see here first brief introduction of control volume and steady flow system and after that we will see here the mass balance and energy balance for steady flow process. As we have already discussed that control volume is basically defined as one fixed area upon which the study will be focused and mass or matter will enter and leave the system continuously. Control volume system will interact with its surrounding in terms of heat energy and work energy. For more detail about control volume system, please refer the post “Control volume system in thermodynamics”. Steady flow process is basically a process where fluid is flowing through a control volume and thermodynamic properties of fluid remains constant with respect to time while thermodynamic properties of fluid may vary with respect to space coordinates. We can say in simple way that mass and energy of the system throughout the control volume will be remaining constant with respect to time. For more detail about steady flow system, please refer the post “Steady flow process in thermodynamics”. 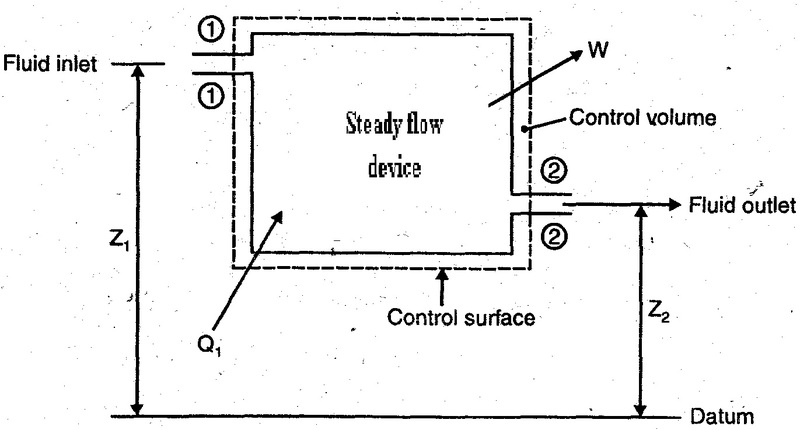 Let we have one steady flow system as shown in following figure, we can see here that one stream of fluid is entering in to the control volume and one stream of fluid is leaving the control volume and there will not be any accumulation of energy within the control volume system. As we have assumed here that this is a basically steady flow system and therefore thermodynamic properties of fluid entering and leaving the control volume will be constant with respect to time. 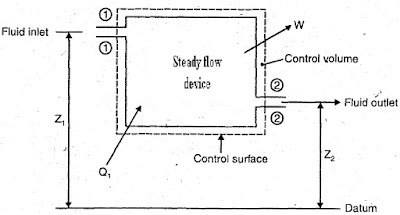 Let section 1-1 is entrance section of control volume and fluid is entering to the control volume system from here and similarly section 2-2 is exit section of control volume and fluid is leaving the control volume system from here as shown in figure. Let Q is the heat energy provided by the surrounding to the system and work energy W is provided by the system to surrounding. For steady flow process, net quantity of mass contained within the system will never change with respect to time and therefore according to the principle of conservation of mass, we will have following statement for mass balance for a steady flow process. Or we can also say that mass flow rate entering to the control volume will must be equal to the mass flow rate leaving the control volume and hence we will have following equation of mass balance for a steady flow process. Above equation of mass balance for a steady flow process is also termed as equation of continuity. Where, V1 and A1 are the velocity and area of cross section of stream respectively at section 1-1 of control volume system. Similarly, V2 and A2 are the velocity and area of cross section of stream respectively at section 2-2 of control volume system. For steady flow process, net quantity of energy contained within the system will never change with respect to time and therefore according to the principle of conservation of energy, we will have following statement for energy balance for a steady flow process. Where, H1 and H2 are enthalpy and Z1 and Z2 are the distance of entrance and exit section of control volume from datum line as shown in figure. Above equation is termed as energy balance equation for a steady flow process or we can also say this energy balance equation as steady flow energy equation. We will see another topic i.e. "Equivalence of Kelvin Planck statement and Clausius statement" in our next post in the category of thermal engineering. What is Carnot cycle and its efficiency?